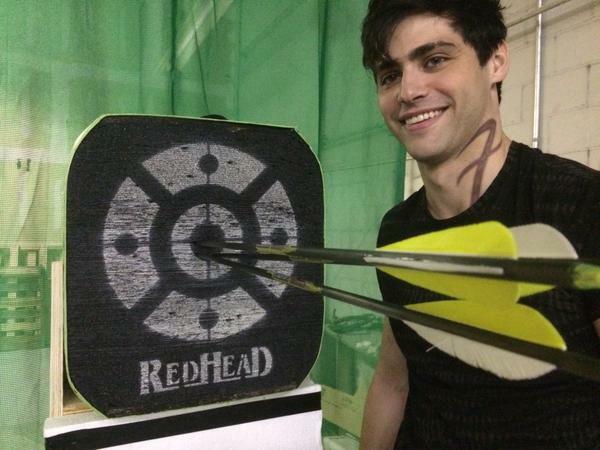 Today’s photos from the set of Shadowhunters were right on target. Also, it was a highly entertaining clash of fandoms involving Alan Van Sprang and Shadowhunters and Reign, back when he had another son named Sebastian, played by Torrance Coombs. LMAO I would LOVE to know why Batman was brooding next to Alec Lightwood’s archery swagger showoff. And oh god, I love those tweets between Torrance and Alan. So proud that “Bash” actually knows about “Sebastian” (since he’s not well known by non book readers). And hahaha, the Red Devil. Fandom, feast on this new name for dear Clary Fray the Red Devil. Oh my goodness now Torrance Coombs is totally a fan of the show too- the randoms are colliding and it’s so beautiful!! Fathering very very hot children named Sebastian. OMG! look at that smile 🙂 And wow! he’s really killing it huh! Plus he looks smoking hot with a bow and arrow…aaarrrr! I am jealous of Magnus coz he’s gonna kiss and hug him and all other things *wink*wink* hahaha! WE LOVE YOU MATT! me & my princess loves you so much! Don’t you dare stop being amazing. It’s also possible that he’s been doing archery for a while. Just saying. I mean, I have no idea, but it is possible. Or maybe he’s just really damn good. Unlikely, but I’m considering all possibilities here.